If you already have a home stereo system, the thought of starting over from scratch just to add support for high-quality wireless music streaming is daunting. Where do you even begin, and what do you do with your old receiver that’s working perfectly well? Stop right there. 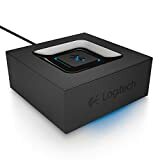 Instead fo dumping hundreds or even thousands of dollars on new components, check out the Logitech Bluetooth Audio Adapter. This $22 device connects to any receiver you already have, adding high-quality Bluetooth streaming with 50-foot range to your system. Pick one up and you’ll never have to worry about physically connecting your smartphone again.